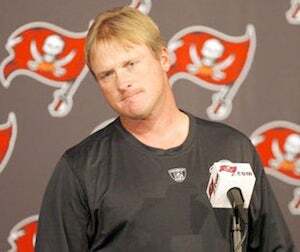 So What Does Jon Gruden Really Think Of His New Employer? Having a selective memory and no access to Google comes in handy during a job search. That way, when a network hires you to talk football they aren't embarrassed by old quotes like this one. Jon Gruden Joins "Monday Night Football" Crew. Seriously. "I don't watch ESPN. I don't believe half the [expletive] people on the channel, personally – no disrespect. But if Bruce Gradkowski is throwing games in Toledo, how in the hell does he lead the NCAA in passing percentages? That is a crock. You know, these reports make me sick – really. I don't believe [there is] any truth to it, and I'll go to my grave believing that. I hope ESPN 3 or 4 has real sources behind this story, because it has nothing to do with the kid. He's a great kid. He wants to be great. This is very uncharacteristic, in my opinion, of 'professional' journalism." I guess Norby (!) Williamson [ESPN's programming chief, for those not in the know] was willing to let bygones be bygones since Gradkowski wasn't formally accused of anything—even if his teammates were clearly up to something. (No disrespect.) Of course, this also opens up the possibility that Gruden has never actually seen "Monday Night Football" and believes it to be some sort of cooking show. That should be a fun first day. ESPN4? That Was Supposed to Be A Secret! UPDATE: ESPN's official response: "Ultimately that candid commentary actually provides the foundation for successful TV commentary. We might not always agree when a newsmaker takes a shot, it's about serving the fans and candid insight is important."